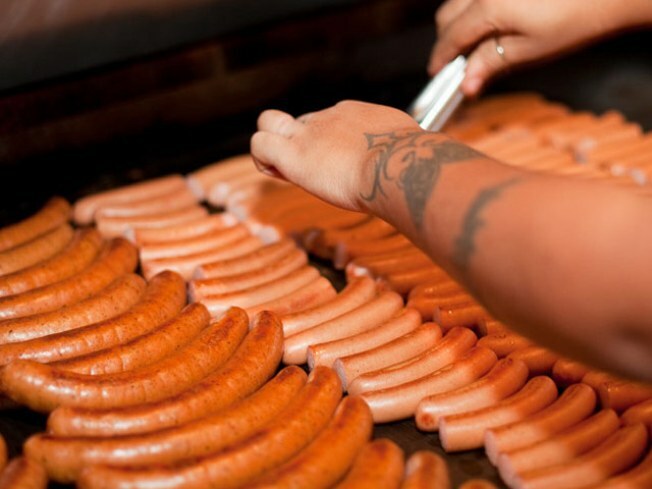 Get stuffed at the Bark Hot Dogs and Sixpoint Craft Ales Beer Dinner. WOOF: The only thing keeping us from eating every meal at Park Slope’s Bark gourmet frankery is the price, and at tonight’s Bark Hot Dogs and Sixpoint Craft Ales Beer Dinner, that’s moot. A cool $40 gets you a full five-course feed – including crispy pork with spicy pickled chili mayo, or choucroute garnie with hamhock and smoked bacon -- each course paired with Sixpoint suds (including the Bark Red Ale, one of two Bark Sixpoint exclusives). Plus, you can take home half-gallon growlers of the stuff for just $12, bottle included. Reserve a spot for seatings at 6:30 and 9PM. MULTITALENTED: Actress Lauren Ambrose presses the same pipes she used to voice “Where the Wild Things Are”’s K.W. into service for a night of popular song with old-time flair, drawing from the repertoires of Fanny Brice, Saint Vincent and others. Joe’s Pub,9:30PM. ART SCHOOL: Tonight’s live Glass-on-Glass event at the Soho Apple Store has all the tropes of an old-school art happening: “This American Life’s” Ira will recite an Allen Ginsberg piece while (his cousin) Philip backs him on piano with his chamber ensemble (including his GF Wendy Sutter on cello). The piece is a poem Glass (the elder) used to play with Ginsberg himself, the Vietnam-era "Wichita Vortex Sutra.” And the whole thing is something Glass (the younger) describes on his blog as “reading a poem inside a helicopter.” 7PM.